Fingerjoint stud lumber is manufactured by taking short blocks of kiln-dried lumber, cutting a 'finger' profile into each end, applying the appropriate adhesive and machine-pressing the pieces together to make a longer piece of lumber. Fingerjoint technology allows the softwood lumber industry to recover these blocks of premium grade lumber that, in the past, would have been discarded. There are two main categories of fingerjoint lumber: (i) vertical stud use only; and (ii) structural fingerjoints. The first category uses a polyvinyl acetate ('white glue'), and is limited to normal short term bending and tension loads. It is designed and graded for use as vertical wall studs. 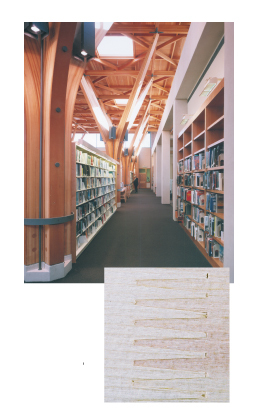 The second category uses a phenol-resorcinol formaldehyde adhesive ('brown glue') which allows the product to be used for both interior and exterior load-bearing applications, such as beams, and roof and floor joists. Both categories of fingerjoint lumber meet North American and international grading rules that are more demanding than those for conventional sawn lumber. For example, fingerjoint lumber is also required to meet special quality standards for the strength and durability of the joints. They must be as strong as, or stronger than, conventional sawn lumber of the same grade, dimension and species. Strong, durable and cost-effective, fingerjoint studs are ideal for building applications, particularly where cost and performance are key considerations. The major application is for use as vertical wall studs, and they are growing in popularity as the products of choice for builders, designers and architects. Straightness The two most important advantages of fingerjoint studs are their straightness and dimensional stability. Because short lengths of wood are combined to make longer pieces, the fingerjointing process minimizes the twisting and warping that is associated with dimension lumber, thus resulting in a longer, straighter piece of wood. Durability Fingerjoint studs will stay straighter than conventional sawn lumber when subjected to heat or humidity. They cause fewer warranty claims, due to the elimination of nail pops in drywalls and other wall-related problems. NLGA product standards control the strength of the joints, the type of glue used to join them together, the quality of wood that must be present at the joints and the grade of the entire stud. Strength and bonding tests are administered many times daily to ensure that the studs meet the requirements of the North American lumber grading system. Quality assurance is confirmed through independent third party verification. Predictability On average, fingerjoint studs are tested for moisture at 5 or 6 points along each stud. Wet blocks are removed, thus ensuring that 100% of the stud meets or exceeds the standard. In contrast, conventional sawn lumber is tested linearly for an 'average' moisture content per piece, so wet spots can occur. Fingerjoint studs are also more predictable because the blending of wood grain in the fingers and blocks counteracts any twisting and warping that can occur in conventional studs. Versatility The use of fingerjoint products is limited only by your imagination. Fingerjointing typically is applied to dimension lumber. But it is also used to manufacture decorative items such as mouldings, cabinetry and even guitars. More importantly for the building and construction sector, fingerjointing technology allows the homebuilder to produce long structural spans that would not be possible with conventional sawn lumber. Positive Ecological Impact Independent research by the Athena Sustainable Materials Institute shows that wood is the most environmentally friendly building material. Fingerjointing further protects the environment by achieving a higher yield from each tree harvested. Cost-Effectiveness 'Building Green' doesn't have to cost more. In fact, using our fingerjoint studs can reduce your homebuilding costs substantially. Conventional stud grade lumber allows more white speck rot and wane. The raw material used in fingerjoint studs is of higher quality overall. Without any need to cull unwanted pieces, pre-cutters, panelizers and modular homebuilders can achieve up to 20% higher yield from the purchase, making their operations more cost-competitive. Fingerjoint studs. They're a better building product ... and they're good for the environment!